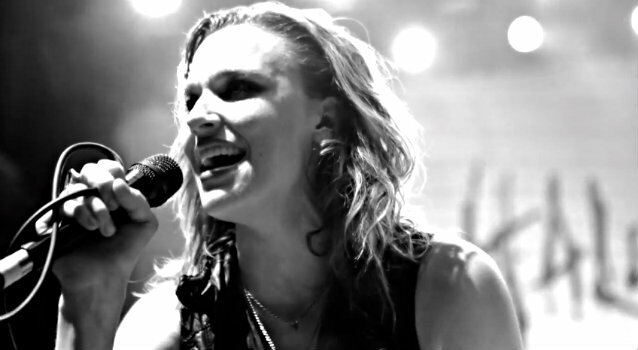 HALESTORM's video for the song "Mz. Hyde" can be seen below. The clip was directed by award-winning filmmaker Daniel E Catullo III and produced by the City Drive Entertainment Group. The video is a montage of live footage captured while out on a European tour with ALTER BRIDGE. Lyrically, "Mz. Hyde" addresses HALESTORM singer Lzzy Hale's Jekyll/Hyde personality and wound up serving as the thematic glue that binds the band's latest album, "The Strange Case Of…" together. "It was one of the later songs we wrote," Hale told Yahoo! Music in an October 2013 interview. "At one point, we were looking at a good chunk of 17 to 50 songs that were all over the place. The guys in the band were saying, 'Well, how can we put all these songs onto this record? We love them all, but there's no common theme.' So I came to them with this idea about this Mz. Hyde character. It was actually a personal thing because it was a character I invented that helped me come out of my shell when I was a kid. Growing up, I was a very shy and introverted, so I more or less had to invent Mz. Hyde in order to be the rock star I wanted to be onstage. "For years, I've been writing about these two sides of myself, and I wanted to capture that in a song. So I brought this to the guys, and all three of them looked at me at the same time and said, 'Oh my God, that's it! Lzzy, you are Mz. Hyde! Once we put this song on the record, everything else makes sense because we have the soft side of you and then the harder side of you. That works because you're like a Dr. Jekyll/Mr. Hyde thing!' And I was like, 'Well, okay, I'm glad we were able to work that out, basically at my expense.'" HALESTORM recently released "ReAniMate 2.0: The CoVerRs eP", a six-song EP features tracks originally written and recorded by JUDAS PRIEST, AC/DC, PAT BENATAR, FLEETWOOD MAC, MARILYN MANSON and DAFT PUNK. "Mz. Hyde" is the latest single from "The Strange Case Of…", which has sold more than 300,000 copies in the United States, according to Nielsen SoundScan.